“Please allow me to introduce myself. I’m a man of wealth and taste”. This Rolling Stones’ lyric is perfectly apropos for whoever wears this watch, and how they are perceived by others. And yes, a woman can wear this 36mm watch just as stylishly as a man can. There is no other watch like a solid gold Rolex. 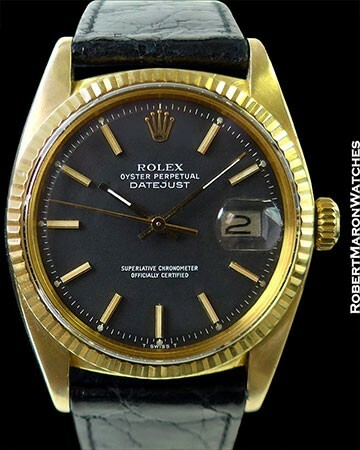 In an historical context, this is a very interesting watch because with its 9817XXX serial number, it dates to 1987, which makes it quite possibly the last model 1601 Datejust ever produced. Rolex was already making sapphire crystal models for a few years when this plastic crystal 1601 Datejust left the factory. This Datejust features a rare black dial, and the watch is in mint condition. These Oyster watches are just the perfect product: looks and function in abundance. The 18k case with its 18k fluted bezel draw the eye to the dial. The color combination of the gold case and black dial is exquisite. 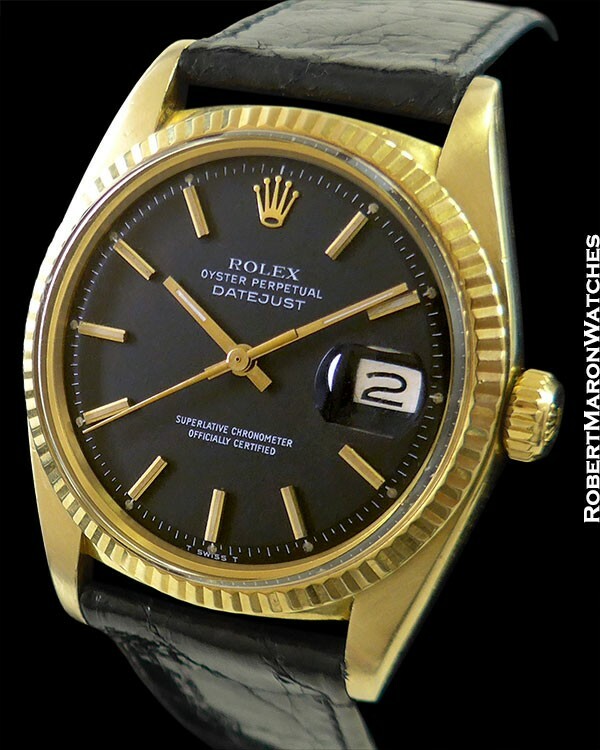 Dial has applied golden Rolex crown, hour markers and hands and date at 3 o’clock. Movement is the automatic winding Rolex Caliber 1570 with 26 jewels and adjusted to 5 positions and temperature. Movement is a C.O.S.C. Certified Chronometer and is in pristine running condition. Watch is on a new unworn black crocodile Rolex strap with Rolex buckle.